Wash your hands with soap completely, try to use non-perfumed or antibacterial liquid soap and wipe hands dry with a clean towel. Use lint-free towel so there won’t be any lint balls stuck to your hands while removing the lens. 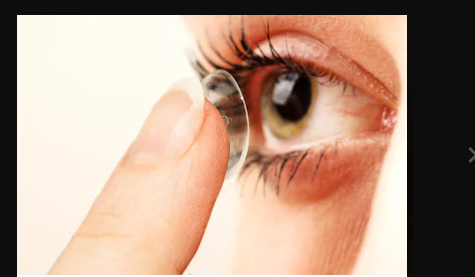 Rinse the lenses using the specified lenses solution to remove debris or dirt, follow this step, unless you are using brand new contacts. Put the lens on the tip of your finger, and check for the lens being on the correct side and not inside out. Some lenses have a number indicator make sure they are not reversed. On the right side, the lens looks like a bowl with straight edges, on the wrong side it looks like a bowl but with slightly curved edges. Unless you have the same power for both the eyes you don’t want to mix up your lens. So try to keep a habit of doing it from one direction while putting it on removing it, right- right or left- left. Now gently use the free hands to hold the upper eyelid in place and with the other free fingers whichever is convenient gently pull the lower lid and hold it. Now looking up gently place the lens at the lower part of the eye, avoid blinking till you finish placement of lens. slowly remove your hands holding the lids and close your eye for a moment, there will be little water, give the eye a moment to rest and slowly blink a few times naturally, allowing the lens to adjust naturally at its position (center). If the lens is not centered correctly, gently hold your lower lid with your hand and slight with the index finger adjust the lens in the eye to correct position. Wait for a few minutes, once placed correctly, the process is completed. If after few seconds or immediately, the lens feels uncomfortable or irritates the eye, take the lens out and check for damages, debris. Clean the lens and start from the first step. If you find the lens is damaged or torn, quickly dispose of them using a damaged lens can cause irreparable damage to the eye. When using fashion lenses such as solotica hidrocor cristal etc. or any other brands always look for the special instructions to follow.